Officially the Azteca horse birthplace, the Horse Breeding Center is also recognized as one of the most prestigious breeding households of Azteca and Spanish Horses. Through the meticulous selection of studs & mares, and the thorough care devoted to the selection of the breeds between the Azteca, Spanish and Quarter Horse, the Center is able to produce a superb horse, one with exquisite conformation as well as exceptional performance. The breeding center is located in Lagos de Moreno in “Hacienda El Cajón”, were mares and stallions are devotedly taken care of ensuring beautiful breeds. This breed was conceived out of a visionary idea that Mexico could at last enjoy its own horse breed. The specific desired characteristics were defined first and foremost to fully satisfy Mexico’s traditional equestrian sport, the “Charrería”. That meant that the horse should be fast, strong, with a comfortable height, an adequate temperament and a suitable conformation. The Azteca was first bred in 1969 as a horse for “Charros”, the traditional horsemen of Mexico. 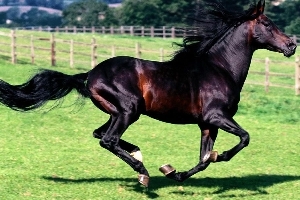 Imported Spanish stallions were bred with Quarter Horses and Criollo mares thus providing the foundation of the Azteca. The three foundation breeds of the Azteca are the Spanish, Quarter Horse, and Mexican Criollo (almost extinct). They were chosen to produce a breed that combined athletic ability with a good temperament and certain physical skills. The facial profile of the breed is straight or convex and the neck slightly arched. Overall, they are well-muscled horses, with broad croup and chest, as well as long, sloping shoulders. Gaits are free and mobile, with natural collection derived from the Spanish ancestry of the breed. From the Spanish the Azteca inherits a calm temperament, its arrogance and an abundant mane and tail, elements of great beauty. The Quarter Horse adds strength, speed and an unconditional disposition, producing a perfectly well balanced and wonderful breed. 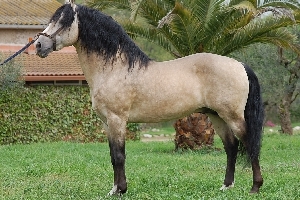 The Pure Spanish Horse, PRE (Pura Raza Española) or Andalusian is of pure Iberian origin and therefore an obvious choice for horseback bullfighters (Rejoneadores) and breeders from both Spain and Portugal, the latter being a place where the art of Rejoneo is greatly appreciated and valued. 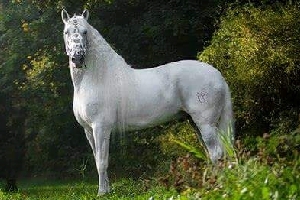 In the development of this breed, the Arab and Berberisc horse had an enormous influence, as it did in this region’s entire culture for centuries. This breed historically comes from the warm plains in Jerez de la Frontera, Seville, and Cordoba. It is in this very region that the Carthusian monks were responsible for preserving the purity of the Spanish breed during the Arabic invasion and conquest of the Iberian Peninsula. It was during the sixteenth and seventeenth centuries that the breed was in danger of extinction due to a series of poor crossings. The Carthusian monks were able to preserve the purest lineage of the breed. The Iberian horse became known as the "royal horse of Europe" and was seen at many royal courts and riding academies, including those in Austria, Italy, France and Germany. 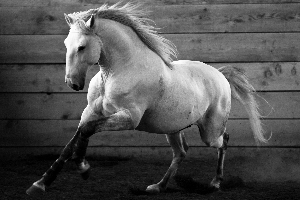 Since then and to this day Spanish horses have been considered the finest in the world. 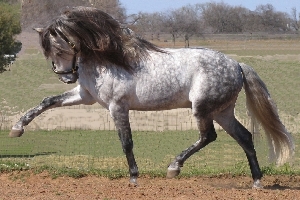 The Spanish is closely related to the Lusitano of Portugal, and has been used to develop many other breeds, especially in Europe and the Americas. 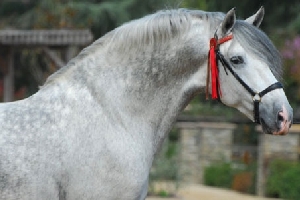 Breeds with Spanish ancestry include many of the warmbloods in Europe as well as western hemisphere breeds such as the Azteca. Over its centuries of development, the Spanish breed has been selected for athleticism and stamina. The horses were originally used for classical dressage, driving, bullfighting, and as stock horses. Modern Spanishs are used for many equestrian activities, including dressage, show jumping and driving. The breed is also used extensively in movies, especially historical pictures and fantasy epics. The Spanish horse’s physical appearance is fascinating and attractive even to the untrained eye: long, thick manes and tails. They are known for their intelligence, sensitivity and docility. Spanish horses are elegant and strongly built. Members of the breed have heads of medium length, with a straight or slightly convex profile and the neck considerably arched. The movement of Spanish horses is extended, elevated, cadenced and harmonious, with a balance of roundness and forward movement. Qualified medical veterinarians as well as world renowned breeders all agree that the American Quarter Horse is without a doubt the finest equestrian athlete. In the 17th century, colonists on the eastern seaboard of what today is the United States began to cross imported English Thoroughbred horses with assorted "native" horses such as the Mustang horse, which was a breed developed by Native American people from horses descended from Spain, developed from Iberian, Arabian and Barb stock brought to what is now the Southeastern United States by the Conquistadors. Later on bred and trained by American cowboys since the Eighteenth century, it is now considered one of the most versatile horses in the world. From head to foot, its muscles and tendons reveal a horse made for athletic requirements such as speed, resistance, strength, and flexibility. The American Quarter Horse has fine characteristics in its head, small, short, refined head with a straight profile, a fine snout, and a strong, well-muscled body, featuring a broad chest and powerful, rounded hindquarters. The quality of the hooves is 100% functional and the reason for its high performance rates. In addition to this, the horse’s temperament is amicable, a quick learner, and has a natural cowboy talent: this horse is wonderful with cattle, and other species, making it easy to work with. The breed is not only well-suited for western riding and cattle work. Many race tracks offer Quarter Horses a wide assortment of pari-mutuel horse racing with purses in the millions of dollars. Quarter Horses have also been trained to compete in dressage and can be good jumpers. They are also used for recreational trail riding and in mounted police units.